"Youth Employment PartnerSHIP” was inaugarated during a special session of the IBS and the World Bank Conference „Globalization, work, and distributional tensions in Europe and Central Asia”. 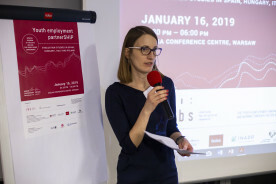 Guests from governmental agencies, PES offices, as well as NGOs working with youth, listened to Iga Magda's introductory remarks and three presentations on the subject of youth employment. disseminating policy lessons, as well as best practices to policymakers and NGOs. Next,researchers from institutions implementing the project presented the newest research on youth employment in the European labour market. Lucia Gorjon (University of the Basque Country), Astrid Kunze(Norwegian School of Economics) and Francesco Trentini (University of Torino) delivered presentations on the impact of a minimum income scheme in Spain, flexible hours for young mother as well as traps of being a temp in Italy. Summary and materials from the event are available here.